Well, I nearly spoke way too soon about surviving the season. I noticed Omar (or what would become OMAR) on Monday and started getting worried. My friend Daisy is still down there staying on the boat and I we started talking about it then. She did what she could to secure stuff and then moved to land for safety on Tuesday. Wed was one of the longest days of my life. I knew it would come really close to a direct hit Wed night and all i could do was watch the weather channel (which had terrible coverage) and sit around all day and reload the 7 or so websites I was monitoring. I had prepared myself for the worst knowing my anchors and the boats around me would not make it through a direct hit from a major hurricane, especially one coming from the SE on this unusual path. I found a bar with wifi and set up my hurricane monitoring command center. My friends joined me later in the day to hang out with me and we even did a DRAM for SENECA. I was able to stay in near constant contact with Daisy through email. 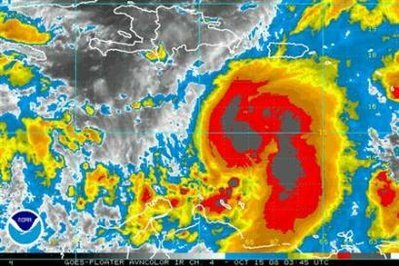 Around 10m it became a CAT 3 storm and started hitting St Croix. Finally at about 2 in the morning when I saw a glimmer of hope that it was moving more east and I could not get much reliable info and I had enough rum in me, I went to bed. I awoke to find out it did veer east and spare a direct hit. Daisy emailed me and she was fine. She had to wait until 2pm for the curfew to life before she could make it to Coral bay and see first hand that all was well. She emailed me this afternoon from SENECA and there was no damage at all! I am incredibly relieved that my friends, my boat, and all of the islands seemed to make it just fine. Way too close a call for me. It was hard to be this far away and feel so helpless. Thanks for everyone’s concern. Now I am really ready to head back down and start sailing again. It was good seeing you the other day,even if it was a short visit. I am sorry for your stress with Seneca and the storm and I am glad everything worked out well. Talking to you gave me “the bug”………Ive been looking at boats ever since you left. Between the racing, traveling, and now sail boat envy, my budget is booked for a while. I will see you down south in January. Keep in touch and let me know where you will be. I will send you updates from Germany and Switzerland after I return.